Roberta, what was the driving force behind writing such a unique management book? I didn’t want anyone else to have to go through what I went through when I was tossed into management at the ripe old age of 24. I’ve seen too many organizations treat a new leader’s indoctrination into management as if they were residents in a hospital. The, ‘This is what I went through, so you too will have to suffer’ mentality is neither productive for a new leader nor is it helpful for those organizations who are striving to create strong relationships with their customers or clients. If you could only give three pieces of advice on what to do during the first 30 days to a person stepping into a new management position, what would they be? Focus your attention on what’s going on around you and above you. By that I mean, observe how work gets done informally, by those who seem to have a knack for getting the resources they need. For example, are certain people being granted resources while the rest of the organization is cutting back their spending? Are there one or two leaders who are able to capture the ear of the CEO while the rest of the team is lining up outside the corner office for a sliver of the CEO’s time? Assess your team and make sure you have the right people in the right roles. Don’t be afraid to make changes if it appears that players are in the wrong slots. Do what you say you will do. New leaders often have high levels of trust since they are starting with a clean slate. The quickest way to increase trust is to consistently do what you say you are going to do. At this point in your management career, you don’t have enough deposits in your bank of trust to make any withdrawals. (A withdrawal is what usually happens if you make a minor mistake.) Like any financial situation, if you withdraw more than you deposit you will be bankrupt (or in your case fired) before you know it. What would be three things that you suggest the new manager not do during the first 30 days? Continue to act like a friend, rather than a boss, to those who used to be your peers. Terminate an employee without having a full understanding of why your predecessor hasn’t done so already. Badmouth your predecessor, regardless of how poorly a job he has done of managing your department. When the honeymoon period, whether it’s 30 days or three months, is over, what are the three most important things this manager should keep in mind? There is no such thing as a honeymoon period. As I explain in my book, Suddenly in Charge, here’s why: the decision to award the position to you may not have been unanimous. Or, there may be people in the organization who believe the job should have been theirs. It is important to keep in mind that some in the organization may not be interested in helping you to succeed. However, in most cases you can overcome this by quickly establishing yourself as a leader and showing management that their decision to promote you was the right one. When a manager is faced with a difficult decision whether it’s dealing with a bad or dishonest boss or a weak employee, what steps do you think the manager should go through in order to make an effective decision? Managers should always presume good intent. It is quite possible that what you perceive as being dishonest is merely an agreement between your boss and her boss. Here’s an example of what I mean by this. You may have seen your boss having lunch with a competitor. What you don’t know is that she has been told that she has 90 days to find a new job. Before taking your observations to the executive suite, give your boss the benefit of the doubt. You can certainly tell her that you happened to see her at lunch the other day. Then be quiet and follow her lead. In terms of looking for an effective mentor, what should a new manager look for? Always look for someone who has actually been in your shoes and has the track record to prove it. For example, would you take instructions on how to jump out of a plane by someone who has never done so themselves? I hope your answer is NO! It’s also about finding someone who is the right fit. I have turned away people from my mentoring program because the fit was not there. You are going to be spending lots of time together, so make sure it’s with someone you can build a trusting relationship with. For more than 25 years, Roberta Matuson, president of Human Resource Solutions has helped leaders in Fortune 500 companies and small to medium-size businesses create exceptional workplaces leading to extraordinary results. As a seasoned consultant with industry experience, Roberta is considered a leading authority on leadership and the skills and strategies required to earn employee commitment and client loyalty. 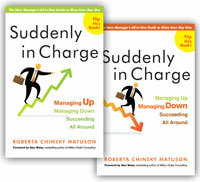 Roberta is the author of the highly-acclaimed book, Suddenly In Charge: Managing Up, Managing Down, Succeeding All Around (Nicholas Brealey, 2011). She is a prolific writer who has published more than 300 articles worldwide. Roberta is frequently quoted in The New York Times, Boston Globe, Inc.com, and CNBC.com. She is a regular contributor to Monster, BNET, Pink Magazine, Yahoo! HotJobs and Careerbuilder.com and is one of the top expert bloggers for Fast Company. Sign up to receive a complimentary subscription to Roberta’s monthly newsletter, HR Matters. Roberta can be reached at roberta@yourhrexperts.com. You will be better equipped to consistently deliver excellence in your work. He works with business leaders to create practical, personalized approaches to improve their most important business outcomes. Read more about Dan Coughlin. Read more about the services Dan provides to his clients. All Rights Reserved	© 2019 Copyright The Coughlin Company.